8 − = zero Required Please enter the correct value. Kraft Foods Inc. (NYSE: KFT) is about to unlock a lot of value for patient investors. 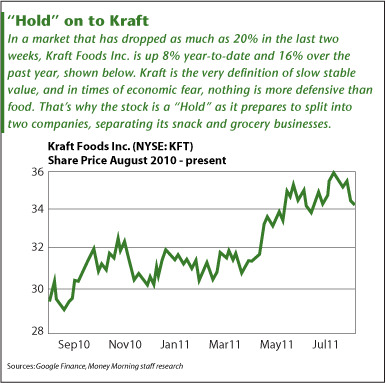 I chose Kraft Foods as my first "Buy, Sell or Hold" pick of 2011 as a hedge against inflation. At the time the world was looking at food inflation caused by fires in Russia, rains in Australia, and droughts in China. The move paid off. In a market that had dropped by as much as 20% in the last two weeks, Kraft is still up about 8% since my recommendation. Kraft is the very definition of slow, stable value, and in times of fear and uncertainty, nothing is more defensive than food. That is exactly why I recommended the stock at the beginning of the year, and why I believe it's a "Hold" today. But that's not all. A recent development has given investors yet another reason to hold on to Kraft. Kraft Foods – which is currently the second-largest global-food company, behind only Nestle SA – announced on Aug. 4 it was going to split into two. It's going to separate its global snacks operations from its North American grocery business, creating two independent companies. One company will include its European and developing markets units and will hold brands like Oreo cookies and Cadbury chocolates; it will have revenue of $32 billion. Meanwhile, the North American grocery business, with revenue of $16 billion, will include such brands as Oscar Mayer processed meats and Kraft macaroni and cheese. The news was a surprise since Chief Executive Officer Irene Rosenfeld – who favors big companies – said just 18 months ago that "scale is a source of great competitive advantage." That's why the company spent $19 billion last year buying Cadbury PLC. Now – with nudging from its biggest investors – Kraft has changed its direction. Large shareholders wanted the company to split and prompted the spin-off from behind the scenes. 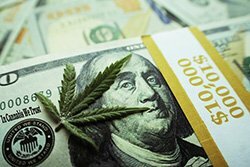 "We have been evaluating this type of transaction over the past several years, and analysts and investors have also suggested this," a spokesperson for Kraft said in a statement. "Creating two strong independent operating entities was not feasible before today. Based on actions we have taken over the past four years, it's an idea whose time has come." The Northfield, IL-based Kraft Foods Inc., founded in 2000, spent years picking up pieces of the global market until it became second-largest global-food company. The scale of Kraft's global operations has allowed it to withstand higher food prices. It's also helped the company to generate a positive return in the market over the last year. Kraft's global reach is one reason why I believe it is under pressure to break up. The Cadbury deal gave Kraft a bigger global presence, but some investors feared the food company wasn't realizing as many cost or revenue benefits as originally expected. Kraft can work better as two streamlined businesses. The new structure will split the company into two types of holdings: a fast European-focused growth stock and an American high-margin dividend-paying value stock. This gives investors the best of both worlds. A split also will alleviate antitrust issues and allow each company to seek more deals. That increases the likelihood of more merger and acquisition (M&A) activity in both Europe and the United States. Kraft has a $60 billion market cap, with an enterprise value of $85 billion once net cash and debt levels are taken into consideration. The company reports a Price/Earnings (P/E) ratio of 19, on a trailing twelve-month window. The company currently pays a 3.4% dividend on a forward-looking basis. When you take a look at what a 10-year U.S. Treasury is paying, the yield is a nice final reason to hold the stock. Kraft's stock rose 0.88% Friday to close at $34.40. Action to Take: Hold Kraft Foods Inc. (NYSE: KFT) (**). When we put a "Buy" recommendation on Kraft, it was trading about 8% lower than it is today, even after the big stock-market sell-off. The stock has held up great in the market in the face of relentless sellers. I love this kind of relative and total return. Kraft is performing exactly as I had hoped it would. Let's continue to hold these shares, and if we get a flash-crash dip in the prices, look to add a few more. Additionally, with the spin-off coming, investors have an opportunity to profit from a real value-unlocking event. It's nice to know that a catalyst is on the horizon to help jumpstart both of the future companies – but be patient. (**) Special Note of Disclosure: Jack Barnes has no interest in Kraft Foods Inc. (NYSE: KFT). Barnes retired to the beach in the summer of 2009, and continues to write from there. He's now the author of the popular blog, "Confessions of a Macro Contrarian," and his "Buy, Sell or Hold" column appears in Money Morning twice a week. 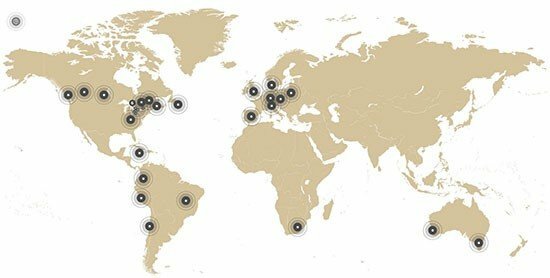 In his last BSH column, Barnes gave us a closer look at Compania de Minas Buenaventura SA (NYSE ADR: BVN). Brace for Inflation with Kraft Foods Inc. This strategy has nothing to do with scale, but rather with breadth. Scale is vertical; breadth is horizontal. This spinoff is about horizontal divestment and allows for vertical growth or increasing scale for each of the units that are formed. The result is the potential for increasing scale, not decreasing scale which is consistent with stated policy. Hi, I've just started receiving the Money Morning newsletter as well as the Money Morning private briefing. I've only just started taking an active role in stock market investments and research, reading this leads me to believe that the current Kraft stocks are due for a split? How does that work when you have shares? Do they split as well? And in doing so will the new shares account for half of the old share price but with the benefit of growing on their own? Guess I'll read up on that next. Very interesting article, thanks.